The Addictive Personality. Understanding the Addictive Process and Compulsive Behavior. Since its publication in 1988, The Addictive Personality has helped people understand the process of addiction. Now, through this second edition, author Craig Nakken brings new depth and dimension to our understanding of how an individual becomes an addict. Going beyond the definition that limits dependency to the realm of alcohol and other drugs, Nakken uncovers the common denominator of all addiction and describes how the process is progressive. The author examines how addictions start, how society pushes people toward addiction, and what happens inside those who become addicted. 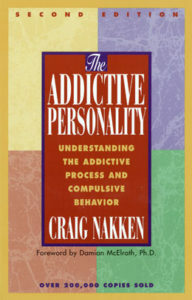 This new edition will help anyone seeking a better understanding of the addictive process and its impact on our lives. Craig Nakken, M.S.W. a certified chemical dependency practitioner, is a lecturer at the Rutgers School of Alcohol Studies and the Florida School of Addictions. A worker in the field of addictions for more than 25 years, Nakken has a private practice in St. Paul, Minnesota and lectures nationally and internationally on topics related to addiction studies. Read the introduction to and chapter one of: Addictive Personality. This file is in PDF format.